Map Description I haven't touched UnrealEd in about a year and a half, but a few days ago I was suddenly overcome by the urge to mess with it again. 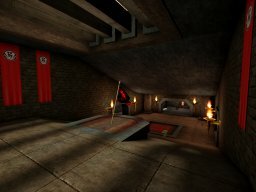 I doubt I have the artistic ability to build something for UT2004, and so CTF-Axia was born. The visuals are nothing special, but I think it plays reasonably well. I'd say that overall, I'm pretty happy with the way it turned out. My previous maps both got some complaints about being too dark and having poor performance in some places; hopefully this release does better in both respects. Any comments are welcome, both positive and negative. Have fun, and thanks for playing. So much ctf these days. nice idea's man can i use this in my server? Lighting is done and it's pretty bright (in a goo way) although texturing and archi are pretty bland. Gameplay is pretty bland too since z-axis is almost inexistant except for the the flag base and the middle part. 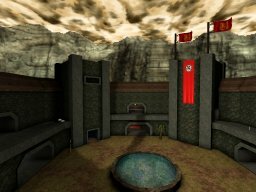 A decent oldschool map. The lighting is nice and bots work well, but as cooloola mentioned it needs more z-axis. It's also a bit too visually sparse in places, especially the center area. The center area could also use some more cover... like, I dunno, a tower or a big statue instead of that pool. I don't know why, maybe it was the size or the gameplay, but this felt more like a JB map than a CTF map. A conversion would be great. QUOTE: "Of course, Uber, do whatever you like with it. :)"